I am not sure how it took me until now to realize the greatness of the slow cooker. You do a few minutes of work chopping things and tossing them into the slow cooker early in the day. Add a few things later on. Stir once in a while, when you think of it. And then, by evening, just in time for dinner, you’ve got the most richly flavorful, savory home cooked meal all ready to go. And just that one crock pot to wash.
Homemade meals that feel like no work at all, that’s the magic of the slow cooker. How did I not realize the convenience sooner? 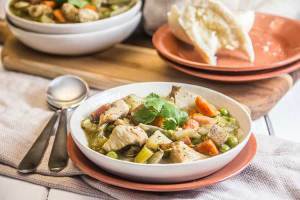 What I made in the slow cooker this week: Chicken Pot Pie Stew. I happen to love the filling of a traditional chicken pot pie so much more than the crust. So I combined all of those delicious, savory flavors into a comforting, hearty stew with chicken, winter veggies, and potatoes. Since the chicken is cooked so very slowly at so very low of a temperature, it turns out tender beyond compare, just falling apart with a spoon. And, by roughly chopping the vegetables into thick pieces, the stew feels like such a satisfying comfort food dish. 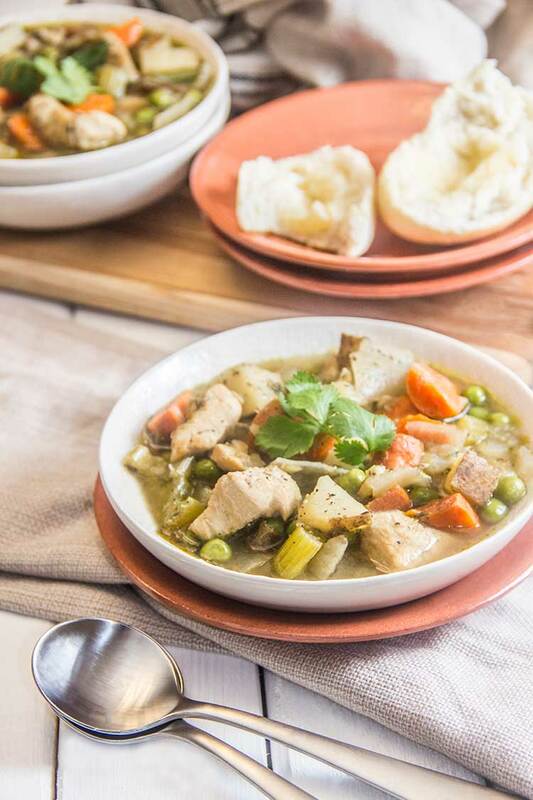 All the veggies feel so nourishing and healthy, and the broth is richly flavored with all of the classic pot pie herbs like bay leaves, thyme and sage. 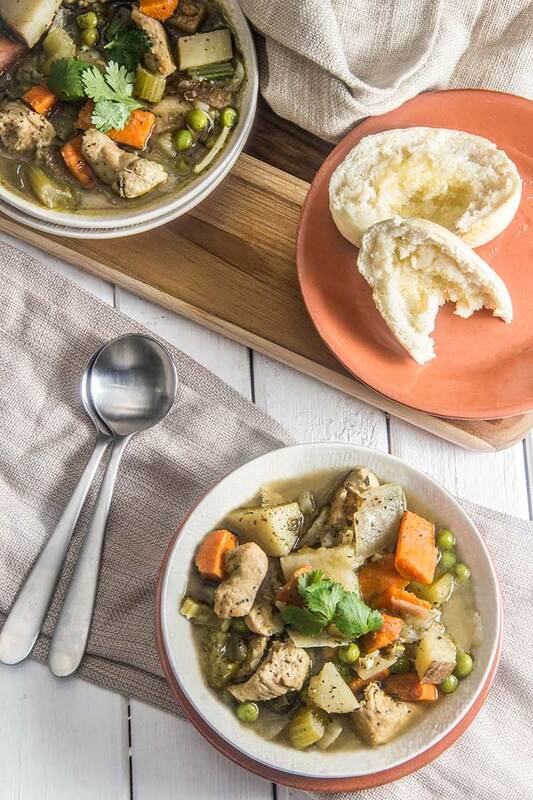 I like to serve this soup with some biscuits or rolls since this chicken pot pie stew doesn’t have the buttery crust! Side Bonus: this dish also holds up really well as leftovers when refrigerated in a covered, airtight container. I like to make it on Sunday for weekday leftovers I can just toss in the microwave. The forecast says our first snowfall of the season is arriving tonight. I don’t know how I let so many winters pass without realizing it, but I’m clear now: I’m seeing many comfort food slow cooker meals in my near future! Add 4 tablespoons olive oil along with chicken, onion, garlic and bay leaves to a slow cooker. Set the heat to High. Season with salt and pepper, stir, and cover. Cook for about 1 hour, stirring occasionally. Add the carrots, celery, potatoes, thyme, sage, and white wine. Season with salt and pepper, stir, and cover. Cook for about 2½ hours, stirring occasionally, until vegetables are fork tender. Reduce the heat to Low. Add the broth and peas, cover and cook for about 1½ hours. Season to taste with salt and pepper, and serve. Wow! What a beautiful recipe and post! I absolutely adore crockpot recipes, so easy! This one looks fab, i can’t wait to try it! About how much is a serving? The recipe was good, but it was too oily for me. I wish I had reduced the oil to about 1/2 the amount specified.